If your favourite part of having games night with friends and family is watching all that monopoly money pile up, then imagine how much you’ll enjoy winning heaps of real cash as you play Monopoly Big Event this week at Gala Slots. Monopoly Big Event is the game of the week from the 21st to the 27th November at the site which means that on top of some incredible game-play and jackpot prizes, you will receive 25% cash back and double comp point all week. Keen gamblers around the world are familiar with this Barcrest video slot, which has been a favourite fixture in land-based casinos for years before hitting the big time online. There are 20 pay lines to play with across five reels. These reels are filled with high-quality images of anything and everything to do with the iconic board game. The top jackpot on offer here is a jaw-dropping £250,000. 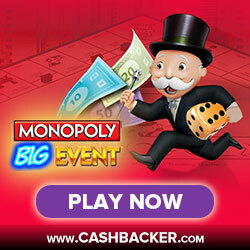 As well as high cash prizes, you’ll find plenty of exciting extra features waiting to be won on the reels of Monopoly Big Event, including scatters, wilds, free spins and multipliers. As if the great prizes on offer at Monopoly Big Event weren’t enough of a reason for you to start spinning the reels of this slot, you will receive a 25% cash back bonus on any amount you wager (up to £100) when you play at Gala Casino this week. This brilliant promotion also treats players to double comp points for every £10 wagered on the slot- that’s Gala’s loyalty scheme which has gained a reputation for being one of the most generous around. All you have to do to take advantage of this week-long offer is sign into your Gala Casino account, opt in and place a wager of any amount up to £100 on Monopoly Big Event. The Opt In button can be found on the promotions section of the site. Make sure you click this before you deposit your cash otherwise it won’t count towards the promo and you won’t receive your 25% cash back and double comp points. Please note that you must wager an equal amount to what you received as part of the cash back bonus before you can withdraw your funds. This offer is open to all registered members of Gala Casino, excluding players based in Russia, Croatia and Albania. Only funds deposited during the promotional period, 00:01 on Monday 21st November and 23:59 on Sunday 27th November, will count towards the promotion. Once you have opted in to the offer and placed your deposit, you have six days to claim the bonus.